A core part of our values is a decided commitment to give back to the community and the help people who need it. That is why we donate 5% of every purchase to Acid Survivors Trust International, helping women and children who have been victims of acid violence. What is acid violence and why does it occur? 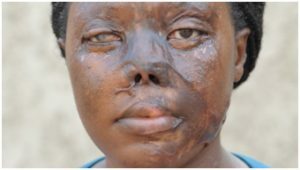 Acid violence is a particularly vicious form of premeditated violence, where acid is thrown usually at the face to disfigure, maim and blind. The targets are mostly women and girls.Acid causes the skin and flesh tissue to melt, often exposing and dissolving the bones below. Survivors face permanent disfigurement and often social isolation – devastating their self-esteem and psychological wellbeing. A survivor needs immediate specialist medical treatment, sanctuary, reconstructive surgery, follow up physiotherapy, counselling and long-term support to rebuild their life. A survivor often requires dozens of surgical procedures. Child victims require extra long-term specialist care from pediatric surgeons (reconstructive and ophthalmic), physiotherapists and counsellors – specialist skills that are often lacking in many countries in which acid violence is prevalent. Every year thousands of people across the world are subjected to deliberate and pre-meditated attacks with Nitric, Hydrochloric or Sulphuric Acid. Attacks often occur as a result of domestic or land disputes, a violent act of revenge towards a girl or woman rejecting a marriage proposal or spurned sexual advances. During an attack, children are often in close proximity to their mother and as a result suffer burns. Sadly, children are also deliberate targets of attacks. Attacks are most common in societies with unequal relations between men and women, and where the rule of law is weak. The easy availability of acid, such as Nitric or Sulphuric Acid used in manufacturing and processing cotton and rubber, contributes to incidents of acid violence in many countries. 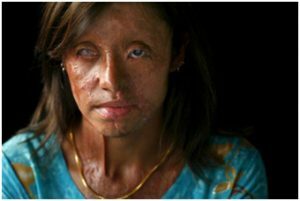 Acid attacks are a worldwide phenomenon that are not restricted to a particular race, religion or geographical location. They occur in many countries in South-East Asia, Sub-Saharan Africa, the West Indies and the Middle East, and there is anecdotal evidence of attacks in other regions. 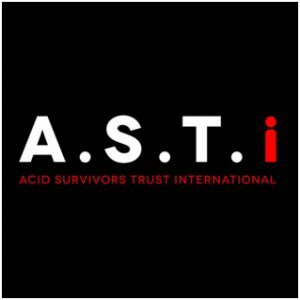 In many countries acid attacks constitute a hidden form of violence against women and children that often goes unreported, and the true number of horrific attacks taking place has only come to light after in-depth research by ASTI and its partners.